Submitted by Alexander Briones on Jan. 21, 2019..
88 out of 100. Incorporating 80+ ratings and reviews. The Apogee Quarter is a USB audio interface specifically designed for Mac and iOS devices, featuring four analog combo XLR/TRS inputs, four Apogee preamps, a Lightpipe input for expanding to 12 inputs, and it has a versatile set of eight output ports. Still, the main selling point of this interface is its premium quality AD/DA conversion at 24-bit/192kHz, which compliments Apple's popular smartphones, tablets and computers really well. All these features are packed into a desktop-friendly angled form factor with an intuitive interface that include an OLED display, assignable touch pads and a single main knob. 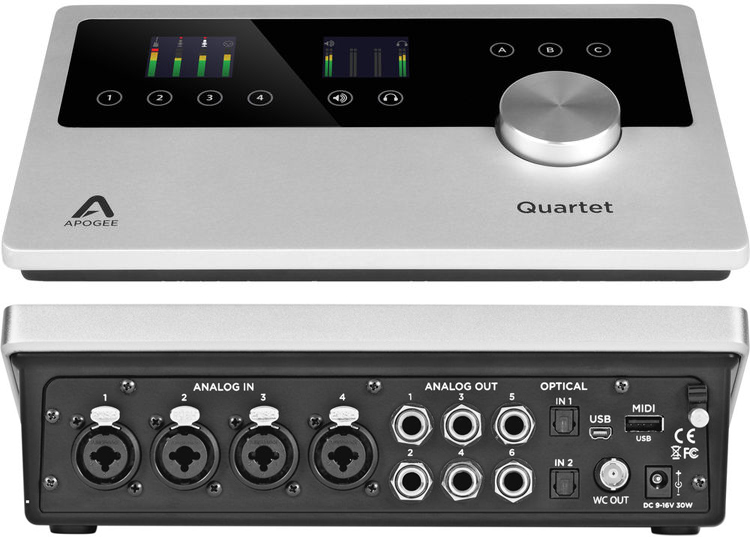 Market response to the Apogee Quartet continues to be overwhelmingly positive, with most reviewers pointing to its sleek appearance, intuitive design and premium quality converters as its main selling points. While Apogee is not known for preamp quality, there are a number of users who commended the quality of the preamps, including self professed snobs who prefer 3rd party dedicated mic preamps. Most reviewers report that this unit is a true workhorse unit, a good contrast to its toy-like size. There are a few who wished for features like the ability to be powered by a dedicated power supply and a simple power button. Software issues also came up a few times. One user cautioned that because of its lightweight design, the unit may tip over when heavy cables are plugged into all the ports at the back. If you are looking for a matching audio interface for your Mac/iPad/iPhone, then you will want to consider the Apogee Quartet, although there are more highly rated options available in our guide to The Best iPad Audio Interfaces.